People hunt and eat wild animals for protein all over the globe: in the Americas, in Asia and Southeast Asia, essentially wherever there are pieces of wilderness with wild animals left in them. So there is nothing special about the fact that people living in and near forests of West and Central Africa happen to eat wild animal meat and probably have been doing so since human appetite began. But today, with the loss of traditional ways in Africa, with the arrival of modern weapons, modern population growth, and modern cities, and with the unprecedented opening of African forests by European and Asian timber companies, the consumption of wild animal meat has suddenly exploded in scope and impact, moving from what was until recently a subsistence activity to become an enormous commercial enterprise. Eating apes is part of a much larger process, the rapidly increasing consumption of wild animal meat from all species in many, perhaps most forested places around the world. And yet the act of eating apes is itself distinctively destructive because of who they are. They are our sibling species, who share with us between 96 and 99 percent of their genetic code. They are special beings who observe the world through eyes and faces like ours, who manipulate the world with hands and bodies like ours, who experience and display emotions entirely recognizable to us, who make and use tools, who live in astonishingly humanlike social systems and deal with each other politically, who show clear evidence of awareness and foresight, who are capable of learning symbolic language, and who laugh in situations you and I might consider worthy of amusement. From my own perspective, the ongoing slaughter of apes for sweet food is a bitter nightmare, and so this book touches subjects that people may prefer not to talk or think or read about. To express the matter a little differently, this book is about hard choices and serious ethical and cultural conflicts. The consumption of apes as it occurs today throughout much of their range combines with other threats (such as habitat destruction) to promise imminent extinctions. Yes, we are at this historical moment rapidly eating and in other ways pushing our closest relatives into the dark chasm of nonexistence. The 20,000 remaining wild orangutans of Borneo and Sumatra in Southeast Asia are threatened with their own distinctive balance of problems, which include an illegal trade in live animals and the wholesale devastation of forests by logging, much of it blatantly illegal. Supposedly "protected" habitat for orangutans has been declining by 50 percent per decade in recent times, which suggests that the red-haired Asian ape could be the first of the four modern apes to go extinct. Those distressing and particular issues require their own book, however, and thus, with a sincere apology to the lovers of orangutans and to the orangutans themselves, Eating Apes focuses on the three nonhuman ape species still enduring on the African continent: gorillas, chimpanzees, and bonobos. But Eating Apes is a also book about people, in particular two individuals who became variously involved in the subject and problem: Karl Ammann, the determined and difficult man who took all the photographs appearing in this book, and Joseph Melloh, the gorilla hunter from Cameroon who became Karl's friend. Of children in the foliage. Apes are distinguished as being among the very few items on the menu capable (before preparation) of laughter as an expression of mirth. I first heard an ape laugh while walking in the great Taï Forest of Côte d'Ivoire, in West Africa. Primate researcher Christophe Boesch and I followed a group of wild chimpanzees as they moved on their daily circuit, a complex progression from food to food to food, from obscure fruits to tender herbs to hard nuts. The chimpanzees in this part of West Africa possess a stone and wood technology, striking hammers against anvils to crack otherwise uncrackable nuts. The hammers can be artificially rounded, quite heavy stones; the anvils may be flat stones with deeply worn pockets. Alternatively, the hammers and anvils may, as they did in this case, consist of rough pieces of hardwood left lying at convenient places beneath productive nut trees. Whenever the chimps we followed came to small groves of ripe nut trees, they stopped to gather handfuls of fallen nuts from the ground, walked and carried them in their hands, and then sat or squatted down in front of their hardwood tools. Christophe and I observed these wild apes lean and hunch intently over their labors. We watched them crack open very hard African walnuts (Coula edulis), hefting heavy hammers made from branches and logs and pounding the nuts, which were carefully positioned in grooves and pockets and crotches of the hardwood anvils. Having cracked and then eaten their fill of the nut meat, these apes left the hammers next to the anvils and moved on. That day's journey was (for me at least) disorienting. I had no sense of direction and little of distance, and the apes regularly appeared and disappeared from sight, proceeding sometimes individually and sometimes in pairs or small groups. At one point, a group large enough to seem like a migrating herd (who knows how many?) stopped at midday for a siesta and spread out around the gray corpse of a giant tree that had collapsed and broken a hole in the forest canopy. A shaft of sunlight pierced the hole and poured bright yellow onto the forest floor, onto the fallen tree and the bushy space around it, and onto the chimps as well, who were sacked out in the sun, faces turned up to the warmth like holiday sunbathers on a beach. After that midday siesta, the chimpanzees roused themselves and continued on their migration, examining a swampy area for apparently tasty plants, climbing trees looking for fruits, and resting from time to time. Once, during a resting period, I sat next to a bush that shook with what was undeniably laughter: gleeful and hoarse and breathy, with an edge of frantic, side-splitting desperation. It was entirely like human laughter minus the vocalized overlay, as if a person without a voice box had just thought of something impossibly hilarious. I heard gasping and panting with a hoarse kind of wood-sawing sound: whuuu, whuuu, whuuu. The bush opened, and I saw two juvenile chimps inside, wrestling, tumbling, chasing, teasing each other, and laughing their heads off. I have observed chimpanzee laughter at other times, in other places. I once watched a grizzled old male chase a juvenile male around a tree, with the little one laughing in delight while the old guy pursued and caught him, playfully biting at his foot and tickling him. I have seen wild-born, orphaned bonobos and gorillas laugh, once again seemingly as a frantic expression of delight and mirth. And I have been told by experts that orangutans, too, sometimes laugh. Animal play is not surprising. Lion cubs play. Wolves and dogs and dolphins play. Many animals play, especially when they are young. I can believe that many animals experience pleasure. It is possible to imagine that some animals experience something we might call "mirth" or perhaps an irrepressible sensation of emotional lightness. But laughter? The famed ethologist Konrad Lorenz once suggested that dogs "laugh," based on his observations of facial expressions during moments of canine delight. But the laughter of apes is entirely different from any mere facial upturn of pleasure. Neither is it even remotely comparable to the high-pitched vocalizations of hyenas that have on occasion been described as "laughter" but are completely unassociated with play or pleasure. As with "the hidden laughter of children in the foliage" in T. S. Eliot's Four Quartets, my own experience of the laughter of apes thus becomes that awkwardly articulated moment in an expedition at once physical and metaphysical. Laughter must be among the most fragile and fleeting of vocal utterances. What does it mean? That apes laugh is undeniable. That their laughter means anything is a matter of opinion. The laughter of apes occurs most often during direct physical encounters, such as a chase-and-tickle game. But according to Jane Goodall, who has studied wild chimpanzees in East Africa for the last forty years, "even removed and comparatively complex events can induce chimpanzee laughter." Laughter may happen without any direct physical contact—during a chase without the tickle, for instance, perhaps in anticipation of the tickle. Goodall has observed laughter in much more complicated circumstances, as when one chimp observes another's discomfort. Older chimpanzees sometimes tease their younger siblings with a twig in a tug-of-war game; the older one may repeatedly pull the twig away from the younger one and laugh at the frustration induced. In one case, Moeza teased her younger brother Michaelmas with a play twig, and finally scampered into a higher place in a tree where Michaelmas was afraid to follow. When the younger sibling screamed in frustration, Moeza, according to Goodall, "gave soft chuckles as she watched his fury." The laughter of apes provokes us to consider the possibility of an underlying complexity of cognition and intellect, to wonder about the existence of an ape mind. Laughter, in this sense, seems akin to the fascinating and peculiar capacity to recognize oneself in a mirror, an ability shared by humans and apes but not by monkeys. The classic test was first conducted by American psychologist G. Gordon Gallup, Jr., who in the late 1960s demonstrated that four apes (chimpanzees) knocked out with an anesthetic and then marked on the forehead and one ear with a spot of odorless, tasteless red dye would, when awakened and confronted with a mirror, reach up and touch the red spots on their own faces. Six monkeys, similarly marked and faced with a mirror, continued to treat the mirrored image as a vision of some irritatingly provocative member of their species, threatening and vocalizing at the image. Gallup concluded that he had shown a "decisive difference between monkeys and chimps," and that chimps were thus experimentally shown to have a "self-concept." Charles Darwin postulated a strong evolutionary continuity between apes and humans, and suggested that apes might therefore possess humanlike emotions, memory, and reasoning. But biologists after Darwin less enthusiastically concluded from the available evidence (mostly in comparative anatomy and paleoanthropology) that the ancestors of Homo sapiens diverged from the line that also produced the four modern great apes some 20 million years ago. Even on the evolutionary calendar that's a long time ago—so long ago, the thinking went, that the continuities between human and ape might prove not so interesting. So humans and apes were considered close relatives who had evolved independently for so long that the relationship between modern humans and modern apes could best be described as that of remote cousins. Based on that reasoning, until a couple of decades ago humans were assigned their own special taxonomic family, the Hominidae, while the great apes were comfortably ensconced in theirs, the Pongidae. Starting in the 1970s, however, laboratory techniques for manipulating the genetic molecule known as DNA advanced to the point where it became possible to look at evolutionary relationships between species far more precisely than ever before. As a result of the last few decades of careful genetic studies, scientists now recognize that the apes are not merely our nearest relatives but nearer to us than anyone had ever imagined. Orangutan genetic material shows itself to be 96.4 percent identical to human genetic material, which indicates (calculating from a schedule of likely rates of DNA change) that ancestral orangutans split off from the larger ape line approximately 12 million years ago, leaving the ancestral group of the three modern African apes (gorillas, chimpanzees, and bonobos) and humans still evolving together as a single genetic lineage. The DNA data show that apes evolved closely as a group and that humans remained part of that group until the first human precursors stepped out into their own evolutionary experiment only 6 million years ago. And the mere 1.3 percent difference between humans and the chimpanzees and bonobos means that we are actually closer to them than zebras are to horses, or African elephants are to Indian elephants. In more practical terms, those numbers mean that the next time you go to the zoo and wander past cages containing chimpanzees or bonobos, you might pause and look into the eye of a being who will indeed look back; and you should know that you (genetically almost 99 percent chimpanzee) are sharing a gaze with someone who is, according to the best measurement, almost 99 percent human. You are on one side of the bars, the chimps and bonobos on the other side, simply because those apes lack a little more than 1 percent of the requisite genes to be treated like humans. And if you linger to gaze at gorillas in the same zoo, remember that they are sitting on the other side of the bars or the moat not because they have done anything wrong, but simply and solely because they happen to be missing just slightly more than 2 percent of the human genome. Structurally, the brains of humans exactly resemble the brains of the nonhuman apes, except in size. The largest gorilla brain on record, around 690 cubic centimeters in volume, still is smaller than the smallest known adult human brain, measured at about 790 cubic centimeters. Simply comparing average brain size suggests intellectual differences between human adults and adults of the other ape species. On the other hand, the fact that an adult chimpanzee brain is distinctly larger than the brain of a human child evokes the possibility of overlapping mental qualities. Cranial capacity is not the same as intellectual capacity, however, and it remains a commonplace act of self-flattery for people to persist in emphasizing that great divide between the intellect of humans and the other apes. Why should we, the makers of such wondrous things as automobiles and computers and atomic bombs, be impressed by them, the makers of mere nutcrackers and termite dippers? We continue to mark not similarity but difference, as if the distinction between us and them is a matter of our own species' pride. Homo sapiens may possess some superficial similarities with Pan troglodytes, it has been declared again and again, but the mental divide between the two species remains uncrossable. "I considered the differences between men and animals," so journalist Jeremy Gavon has recently expressed the idea. "Some were vast. A chimpanzee could be taught to drive a car. It could even be taught to build parts of it. But it could not begin to design it. . . . Our intellect is incomparably more sophisticated than any animal." True, a chimpanzee could not begin to design a car. But, come to think of it, neither could I. Nor could you or any other person working in intellectual isolation—without the help of books, conversations, directions, documents, explanations, and traditions—design a car. Or even a bicycle. Or a pair of shoes. Or a mousetrap. Apes work in intellectual isolation because they lack language. We have language, and therefore our creations and inventions and technologies become collective efforts and cultural products. No one person designed or invented the automobile. Automobiles derive from earlier transportation technologies, and from power and metallurgic technologies that go back as far as the first tool that turned the first wheel and the first fire that smelted the first piece of shiny metal. Nor did one brilliant person hiding in a garage in northern California invent the personal computer. Computers appeared as the consequence of developments in the Chinese abacus, ninth-century Arabic mathematics, the eighteenth-century jacquard loom, nineteenth-century mechanical office machines, twentieth-century electronics, and so on. Bicycles were not possible before bicycle wheels; bicycle wheels were inconceivable before spokes; spokes were impossible before spokeshaves. None of the technologies that have elevated our own species into a position of planetary mastery has been created by an individual person working in isolation and inspired solely by the brilliance of an intellect that is "incomparably more sophisticated" than that of the apes. With your brain alone, with my brain alone (minus language and a language-based tradition), we would consider ourselves very lucky indeed to think of cracking nuts between a stone hammer and a stone anvil. Our greatest human creation is not the tool but the word, not the technology that we so treasure and depend on but the language that has allowed us to talk about it. Language, not technology, is the most compelling artifact of the human intellect. You and I have minds and consciousness, so we believe, but the main reason we maintain such a strange and difficult belief is that we can talk about it. In talking about it, we at once express and demonstrate our own sophisticated mentality. Without talking, without words and the ability to use them, the demonstration of mentality or mind becomes a knotty problem (even though we readily assume that every nonspeaking human being has a mind). How do we measure or think about mind and consciousness in the case of apes, who appear so tantalizingly close to human in some ways yet are ordinarily unable to speak or communicate in the ways we expect? Is their lack of speech the best demonstration that they have no minds (or terribly limited ones), or does their lack of speech mostly construct a rampart against our understanding? Humans may have begun using words relatively recently. Since our ancestors' brains reached the modern size a quarter of a million years ago, it is possible to imagine Homo sapiens began speaking then. The distinctive anatomy of the human throat and thus vocal capacity seem to have been in place even earlier; but perhaps the best indicators of the appearance of spoken language are the archaeological signs of a sudden explosion in art—cultural and symbolic expression—began perhaps 30,000 to 40,000 years ago, in the Upper Paleolithic. Whenever the language barrier was crossed, it is logical to suppose that the crossing was not instantaneous or unprecedented, with the ability to speak appearing as a magically inserted "speech organ," a linguistic deus ex machina. There must have been an extended transition, perhaps an adaptive shift from a somewhat inefficient habit of communication to an increasingly efficient one. And well before the language barrier was crossed, our prespeaking ancestors would have been thoughtful, manipulative, aware creatures, men and women who probably inhabited a mental and perceptual world not so different from ours. They must have somehow been prepared, neurologically and mentally, to press their thoughts into sound shapes produced by tongue and mouth, and thus ready to explore and enjoy the tremendous advantage that a high-speech transmission of auditory information would provide. What would that preparation entail? Our ancestors' preparation for speech could have been, according to one theory, the sort of development that accompanied tool making and gesturing. Before speech, people would almost certainly have been toolmakers, and most likely they would have been gesturers as well. They may have been using a crude gestural language, just as human infants do before they begin to gain control over the muscles of their tongue and so start to talk—and just as any of us might do when scuba diving, when stuck in a foreign country without knowing the language, or when attempting to conceal our true intentions from a third party or an opposing team. Other observations from everyday life reinforce our sense that speech and gesture actually fall on a continuum of communicative behavior and are closely associated neurologically. More than we ordinarily recognize, normal speech amounts to gestural and spoken language working in tandem. Good preachers and orators understand this fact well, and so they almost invariably combine the two modalities. The rest of us often spontaneously gesture with our faces, bodies, and hands as we speak, even when we cannot been seen, as when speaking into the telephone. Likewise, a fiercely concentrating beginner at some difficult manual task (sewing, perhaps, or playing tennis) may find his or her tongue creeping about, uncontrollably moving in lingual sympathy with the hand. Studies of wild apes provide another line of evidence that gesture was the critical prelude to speech. As the Dutch ethologist Adriaan Kortlandt once observed, wild chimpanzees use symbolic gestures (of fingers, hands, arms, body, face) to produce many effective and significant communications. Interestingly enough, several of these gestures seem close to universal or trans-specific, with the apparent meaning immediately recognizable to human onlookers: waving someone away with an underhand or overhand "go away" signal, intimidation displays such as drumming on roots or stomping on the ground, making a "halt" sign the traffic police would use, kissing, holding hands, a superior charitably stretching out a hand to a cringing subordinate, the beggar's desperate supplication. Beyond or behind their significant repertoire of gestures, wild chimpanzees also show a capacity for other sorts of finely controlled, sequential manipulations that involve extended learning and planning: the making and using of tools. In October 1960, Jane Goodall first discovered that the chimpanzees at Gombe Stream Reserve in East Africa were fishing for termites. Insects are a significant source of dietary protein among the chimpanzees of Gombe, and by far the most popular is the termite Macrotermes bellicosus, which builds and inhabits large earthen mounds. From October to December each year, when the termites tunnel out to the surface of their mounds, and the reproductively inclined members of their colony sprout wings and begin to fly out to form new colonies, chimpanzees catch them as they emerge from the holes. The winged termites are large and fat and obviously make good food. Indeed, chimpanzees may be competing with baboons, monkeys, small mammals, and even peopleto catch and eat these winged bundles of protein. But the Gombe chimpanzees also fish for the wingless soldiers of these colonies, who ordinarily remain deep inside the mounds guarding against intruders. Whenever an intruder or intruding object enters the nest, these soldier insects attack with their fiercely gripping mandibles. Chimpanzees take advantage of this inclination by fashioning long, flexible probes from grass or twigs and inserting the probes deep into a termite exit hole to disturb the soldiers. The soldiers attack, bite, and hold on with their mandibles, and the chimpanzees carefully draw out their termite-laden probes and gobble up the insects. Since the tunnels go deep and tend to be narrow and twisty, chimpanzees must fashion their probes to the correct length, thinness, and flexibility. And since in withdrawing the probe it is easy to brush off the clinging insects, chimpanzees spend a good deal of time learning how to termite-fish properly. They learn by watching and imitating older members of the community; and they usually achieve the proper technique around the age of five or six, with young females acquiring the skill about a year earlier than males. Not long ago, toolmaking was considered one of the defining characteristics of being human. After Jane Goodall's first publications about chimpanzee termite-fishing at Gombe, the description toolmaker was quietly removed from our list of unique human characteristics. We now know that chimpanzees make and use a wide variety of tools, and that their tool production and use show some of the marks of language production. Both tool and language production involve refined and sequential motor control. Both appear to be mentally deliberative: that is, both are produced and used sparingly in appropriate ways, suggesting observation, planning, and decision making. Both look clearly to include learned behaviors, in which the learning probably happens as a combination of observation and imitation. And, quite like human language behavior, the tool-using behavior of chimpanzees shows signs of cultural differentiation. That is to say, chimpanzee communities in different parts of Africa have distinctly different traditions of tool use. Tools and uses for tools have appeared across Africa in various chimp communities, probably invented by clever individuals and modified by other clever individuals within the community, then copied and imitated and sometimes shared. Some chimp technologies have spread only locally, within a single community or two, while others seem to have spread across an entire region. As mentioned above, chimpanzees at Gombe National Park, in Tanzania, fashion and use long, flexible twigs or blades of grass to fish for termites in termite nests. On the opposite side of the continent, across a narrow stretch of patchy habitat that reaches from the Sassandra River in Ivory Coast west through Liberia and Guinea to the Moa River in Sierra Leone, various chimpanzee communities specialize in pounding stone and wood hammers onto flat stone or wood anvils in order to crack open the very hard nuts of six different species; nut cracking too is a difficult skill to master, and infant and juvenile chimps develop their abilities through years of imitation and practice. Meanwhile, in the arid region of Tongo (in eastern Democratic Republic of Congo), chimpanzees carry around with them the water-filled roots of a Clematis plant, which they use and sometimes share in the style of a water bottle. Cultural learning among chimpanzees is obviously limited by the fact that they cannot talk about what they do. They have no natural language (as far as anyone has yet been able to determine), a limitation that may appear more serious to anthropologists (who regularly define culture as uniquely human) than it does to anthropoids. But one of the clues about the special mental world of the apes arises from long-term research on chimpanzees at a half dozen to a dozen sites, combined with occasional observations elsewhere, for a total of almost fifty different locations in Africa. Every chimpanzee group studied so far has shown us a different preferred way of doing things, flexible behavior that must be transmitted through learning and tradition. If we consider just the making and using of tools, every chimpanzee group studied is using a unique set of tools and tool techniques. Chimpanzee tool-using traditions, in short, are distinctive more for diversity than commonality. Moss may become a sponge in one place, while leaves perform that function in another. Leaves can be wipes elsewhere and containers in yet another place. Small stems in one locale will be turned into probes or lures, whereas leafy twigs farther afield might become whisks or toys. Small sticks can be used as probes and lures; long sticks as hooks, drills, lures, and missiles; thick sticks as missiles, clubs, and hammers; and rocks may be transformed into missiles, clubs, hammers, or toys. So the daily lives of wild chimpanzees provide more support to the intriguing theory that, in human evolution, a deft and sometimes symbolic manipulation of hands prepared the way for similar kinds of tongue and throat manipulation. But to my mind by far the most compelling evidence for such an event appears in the astonishing recent successes of experimenters teaching symbolic language to captive apes. Robert Yerkes, the psychologist often considered to be the father of American primatology, once thoughtfully declared that he could think of "no obvious reason why the chimpanzee and the other great apes should not talk." That hunch was first seriously tested in the 1930s when an American couple, Winthrop and Luella Kellogg, experimentally raised a chimpanzee baby, Gua, alongside their own baby boy, Donald. The results, alas, were discouraging. Gua developed very quickly and became physically strong and mobile a good deal faster than did the child, but after several months of the best baby treatment the Kelloggs could provide (with both baby and chimp diapered, bottled, coddled, fussed over, spoken to, and so on), the little person began to speak, but the little ape did not. The Kelloggs became convinced that their Gua could understand a vocabulary of around one hundred words, but he never uttered one. Meanwhile (so rumor has it), the human baby, Donald, started making chimp noises, and the parents, alarmed at this unanticipated reversal, terminated their experiment. A decade later, another American couple, psychologist Keith Hayes and his wife, Catherine, raised a chimpanzee named Viki in their household as if she were their own baby, and they eagerly spoke to her and tried to teach her to speak back. But after six years in this nurturing human environment, poor Viki probably understood a good deal of spoken language but could only with a great effort produce the strangled approximation of four words: mama, papa, up, and cup. The conclusion from these early failures seemed to be that chimpanzees, and by extension probably all four of the great apes, are intellectually incapable of learning human language. Around the same time an emerging theory among linguists held that language was uniquely human, a tendency or talent embedded at conception in the mysterious latticework of every person's brain: an inherited, species-wide "language organ." As the best known and most polemical proponent of this theory, Noam Chomsky, once remarked, "Acquisition of even the barest rudiments of language is quite beyond the capacities of an otherwise intelligent ape." In fact, the early ape language researchers had unthinkingly confused language with speech, an association that would exclude the language of deaf people who in the United States use a gestural language known as American Sign Language. And the early failures had demonstrated only that chimpanzees are probably incapable of producing symbolic language through manipulating their tongue and larynx. Indeed, both Gua and Viki seemed capable of understanding language; and little Viki, at least, had demonstrated an intriguing creativity. She was unable to say the word car, but she had figured out how to ask to go for a ride in the car by tearing out pictures of cars from magazines and handing them, as if they were tickets, to her human adoptive parents. In any case, Viki's eager efforts to express in vocalized speech the words mama, papa, up, and cup were recorded on film; during the 1960s, Allen Gardner and Beatrix Gardner at the University of Nevada in Reno watched that film and noted how difficult it was for Viki to say those four words, but how expressively she gestured as she tried to make her intentions and desires known. The Gardeners thus decided to try a gestural language, and after some consideration they chose American Sign Language (ASL). ASL consists of around fifty basic signs produced through a combination of hand shapes, movements, and placements against or across various parts of the body. The signs of ASL include some that have no clear relationship to the object or event they indicate (index finger drawn across the forehead means black) and others that are iconic (stroking imaginary whiskers across the face means cat). Individual signs are combined, like spoken words, into longer sentences, using rules of syntax to create meaning. Indeed, ASL works the same as any spoken language, except that it happens to be much slower and therefore, from necessity, it contains shortcuts. Shortcuts include the absence of the linking verb to be, so that the spoken "You are happy" becomes, in sign language, "You happy." Nouns are also frequently transformed into verbs, using syntax and gestural emphasis to clarify meaning, so that a spoken "Give me an apple" might become a signed "Apple me." Just as earlier experimenters had done, the Gardners (and then Roger Fouts, their best graduate student, who soon took over the project) presumed that the most sensible way to conduct this experiment was to raise a chimpanzee from infancy within some approximation of a human household, and thus to teach language to an ape in much the way that language is passed on to human children. And so their first experimental subject, a baby chimpanzee acquired in the summer of 1967 and named Washoe, was bathed, played with, and signed to in ASL. She also very quickly began combining her vocabulary spontaneously, as in the sentences "Gimme sweet" and "Come open." Washoe would ask for a tickle game by saying "Roger you tickle"; to be let outdoors by signing "You me go out hurry"; to get something out of the refrigerator with "Open food drink"; and to note the sound of a barking dog she could hear but not see with "Listen dog." Roger Fouts's project ranks today as the longest continuous ape language study in the world. He currently works with five chimpanzees who inhabit a large, ape-friendly enclosure at Central Washington University in Ellensburg, Washington. The five chimps include Washoe, three other adults, and a younger adult male named Loulis. Washoe has been using sign language with humans since 1967; the three others began in the 1970s. Although Loulis is an active member of the chimpanzee linguistic community, he has never been taught sign language by humans. Indeed, the human experimenters deliberately restricted their signing in the presence of Loulis, communicating with the other chimps using only seven essential signs: which, what, want, where, who, sign, and name. But by his eighth day in the cage, Loulis had made his first spontaneously learned sign. Within eighteen months, he was using two dozen signs spontaneously, none of them from the seven that people used in his presence, and he eventually became entirely fluent in the language solely from observing and imitating his cagemates. Today, all five chimpanzees at Central Washington use American Sign Language well enough to have conservations with human deaf signers, even when those people have never communicated with apes before in their lives. What does it mean when apes engage in such complex symbolic behaviors? I believe it means that the apes share something of our human mental world. It suggests the further possibility that apes have a legitimate mental existence, that they have perhaps a mind and even possibly a consciousness not so very different from ours. Speech requires a speaker: an ego-centralized intelligence, an organized sense of self and others. Still (as I noted a while back), adult human brains are distinctly bigger than the brains of adult nonhuman apes, and if the great technologies that so distinguish and isolate our species came largely as a consequence of human spoken language, we might reasonably presume that language capacity appeared as a gift or a consequence of the larger human brain. But where did the larger brain come from? To rephrase that question: Since the brain is by far a mammal's most metabolically expensive organ, how did it happen that only our ancestors managed to acquire (consistently, regularly, over extended time) the calories needed to purchase and maintain that admittedly wonderful piece of equipment? Inside a forest at the edge of the crashing Atlantic, in Côte d'Ivoire, I once was invited to observe the clues to a curious archeological mystery, which I believe has not yet been perfectly solved: a few scratched and marked flat rocks skirted by small heaps of cracked shells from two species of Acatina giant land snails. The large spiral shells, striped in brown and nicotine yellow or shades of drab olive, appeared disproportionately scattered to one side of the flat rocks, suggesting that the agent who created the heaps had squatted down, methodically cracked the shells by hammering them on the anvil-like rocks (hence the scratches and marks), and tossed the shells to one side. Several of the shells were nearly intact save for a smashed top end, suggesting a technique of breaking open that top end and reaching into the shell to get at the meat inside. Since we were moving into the region of West Africa where wild chimps use stone hammers and anvils to crack open hard nuts, had we stumbled across a new if similar case of chimp ingenuity? On the other hand, Acatina is also food for humans, so perhaps the shell heaps merely indicated that local people had been harvesting and eating the snails. We asked a local hunter named Daniel Abrou, a gaunt man of middle age with a small mustache and receding hair, to give his opinion: Was the shell breaker and snail eater animal or human? He examined the flat rocks and the shell heaps, and then shook his head and declared (in an African French where viande, the usual word for meat, sometimes also indicates wild animal): "Only meat eats meat raw." Cooking is indeed the quintessential human act or skill, possibly even more significant than speech, since cooking may have led directly to the extra reserves of nutrition necessary, beginning around 1.8 million years ago, for our australopithecine ancestors' spectacular expansion in brain size. Suggestive evidence for human taming of fire, as a direct prelude to cooking, includes thermally altered stone artifacts and circles of clay dated at 1.5 to 1.7 million years ago found at sites in Ethiopia, Kenya, and Tanzania, as well as 1.1.5-million-year-old burned bones from the Swartkans cave of South Africa. Cooking removes toxins, inhibits parasites and disease-causing microbes, and softens or predigests many otherwise indigestible, high-cellulose foods. Cooking, in short, must have opened up entirely new food resources for our human ancestors, including roots and tubers, and it certainly ought to have expanded dramatically the overall reserves of nutrition available. Surplus nutrition is particularly important in this theoretical picture, since the large brain of Homo erectus and early humans would have been nutritionally expensive indeed. Our large brain, which consumes around one-fifth of our total calorie intake, could not have developed (as the fossil evidence suggests it did 1.8 million years ago) without a sudden burst in available sources of nutrition. In short, when we cook our nearest relatives, the apes, we may be displaying the one cultural capacity, predating language, that most clearly marks our own very special distinction from them. 1 Chimps and bonobos divided only around 1.5 million years ago, and they still share some 99.3 percent of their genetic material. They resemble each other so closely that many people at first have difficulty distinguishing individuals from the two species. Bonobos typically weigh about 15 percent less than chimps, and they are more slender, with smaller ears. They also live in less violent, more egalitarian, and more elaborately sexualized societies. Eating Apes is an eloquent book about a disturbing secret: the looming extinction of humanity's closest relatives, the African great apes—chimpanzees, bonobos, and gorillas. Dale Peterson's impassioned exposé details how, with the unprecedented opening of African forests by European and Asian logging companies, the traditional consumption of wild animal meat in Central Africa has suddenly exploded in scope and impact, moving from what was recently a subsistence activity to an enormous and completely unsustainable commercial enterprise. Although the three African great apes account for only about one percent of the commercial bush meat trade, today's rate of slaughter could bring about their extinction in the next few decades. Supported by compelling color photographs by award-winning photographer Karl Ammann, Eating Apes documents the when, where, how, and why of this rapidly accelerating disaster. 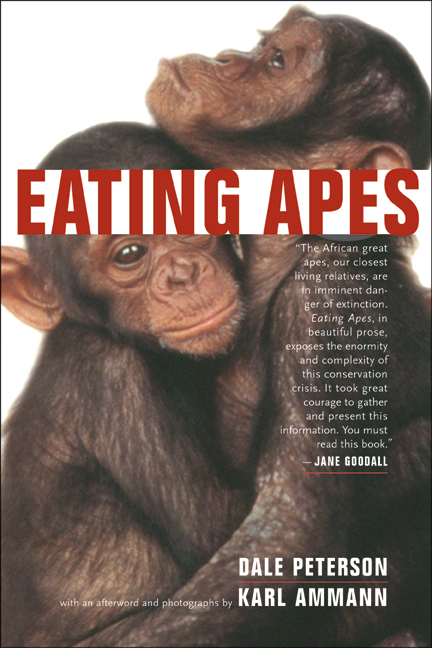 Eating Apes persuasively argues that the American conservation media have failed to report the ongoing collapse of the ape population. In bringing the facts of this crisis and these impending extinctions into a single, accessible book, Peterson takes us one step closer to averting one of the most disturbing threats to our closest relatives. Dale Peterson is the author of Storyville, USA (1999), Chimpanzee Travels: On and Off the Road in Africa (1995), and The Deluge and the Ark: A Journey into Primate Worlds (1989). He is the editor of Beyond Innocence: Jane Goodall's Later Life in Letters (2001) and Africa in My Blood: Jane Goodall's Early Life in Letters (2000). He is the coauthor of Demonic Males: Apes and the Origins of Human Violence (1996) and Visions of Caliban: On Chimpanzees and People (1993). Karl Ammann is an award-winning photographer who has photographed wildlife throughout Africa and Southeast Asia.